Hi everyone. I'm Jesse, I hope I'm not the youngest guy here lol. Thank-you all for allowing me to join your Oldsmobile site. Well hopefully in a few months. 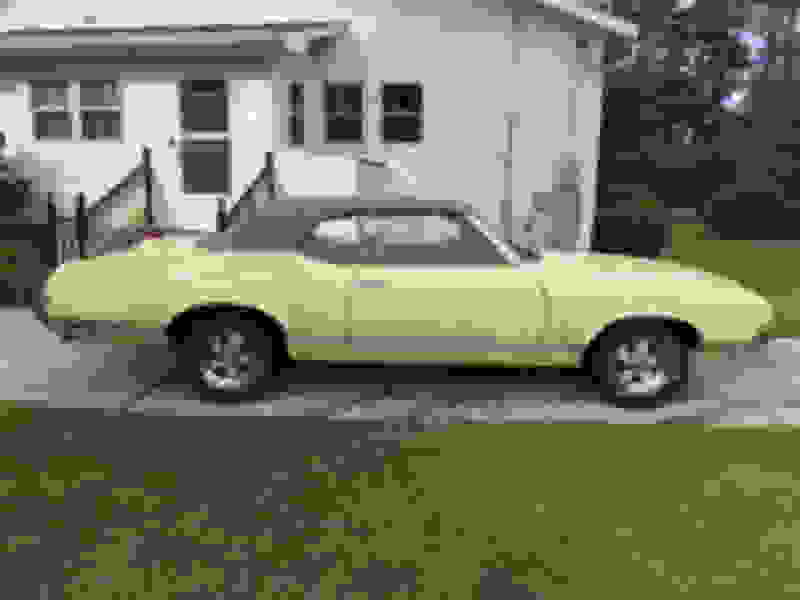 I will bring my new 1976 Oldsmobile Cutless Supreme home. My Dad is going to make some room in the garage and my Mom will make sure I take care of it lol. The car was my Grandma's since it was brand new. She had to move to a retirement housing kinda place but she doing good. They have everything so she wont need to go far other than to come visit us at home. I promised her I would take care of it. The only thing I told her I wanted to do was. Put some nice wheels on it and make the engine look like the chrome ones in big old cars and classic cars. My Dad told me I can't put any hood scoops on it and no big spoiler on the trunk lol. Its going to stay in the garage until her house is sold and my Dad makes some room for it. I never pictured myself with an Old car thats more than twice my age lol but I love it already. I spent some time in the back seat when I was younger, going to the fair and stuff. My Grandma took me everywhere in her car. So I will keep this car forever. I work in a body shop and Im trying to get signed up for an apprentice. But the owner keeps telling me he doesn't have time yet to be patient. So I hope he will get time one day soon. Just sanding, masking and pulling parts off for paint still . I love it thou. I been doing it for 2 1/2 years now so I have my fingers crossed to get a license to do it for myself later in life. I will be able to paint it myself and fix some small spots at the bottom of the doors and the rear quarters need a small patch behind the rear wheel. Other than that it just needs new paint. I don't know anything about old engines or transmissions. 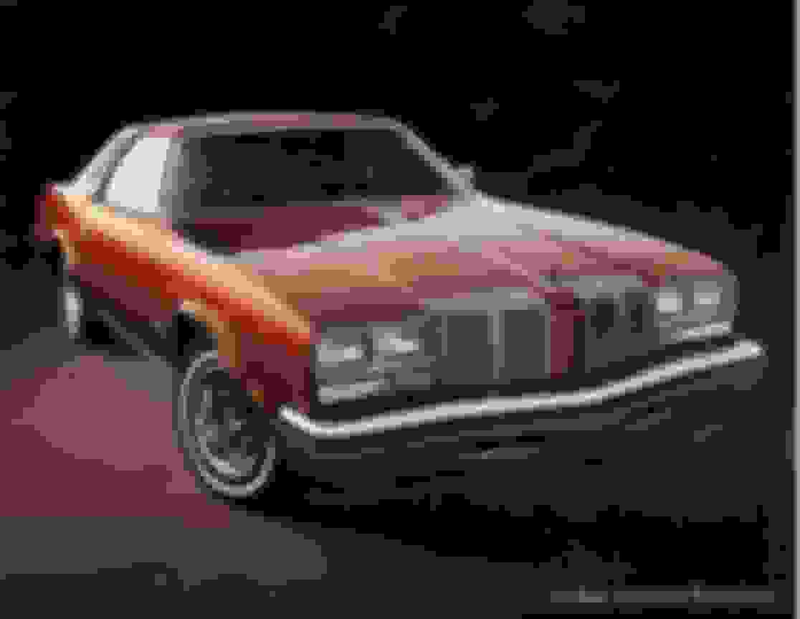 Well nothing mechanical yet really, But I came here to read all about these Oldsmobile cars and hope to make it a really nice show car eventually. I want to go to the local car show here in town every Thursday night they all gather at A & W play music . Its really cool actually. So many big old cars all shined up. Some that look like mine too lol. 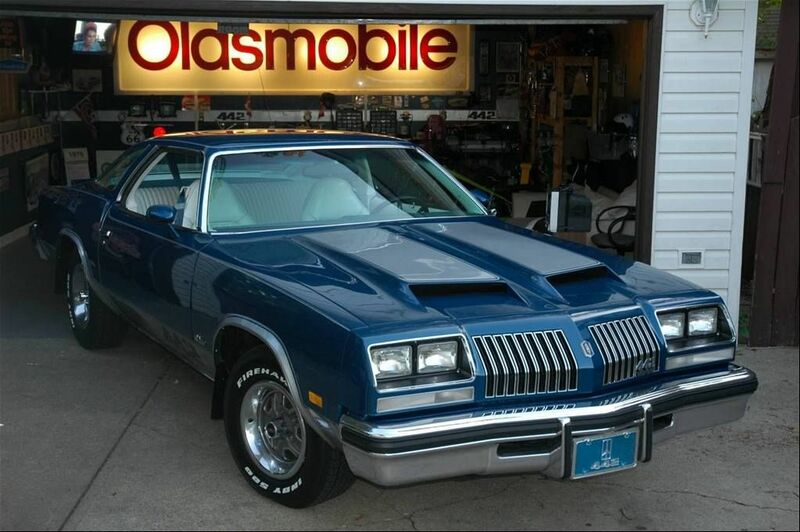 but I never seen a 1976 Oldsmobile go yet. I will be the first. Anyway, I won't fill the site up with my post lol, I'm just so happy to be here and I hope you guys won't be to hard on me lol. My Dad is hard enough on me lol. I'm going to do some reading on your site and come up with a plan on how I would like my Oldsmobile to sound first and look like eventually. I'm crazy excited to be here on a classic car site. 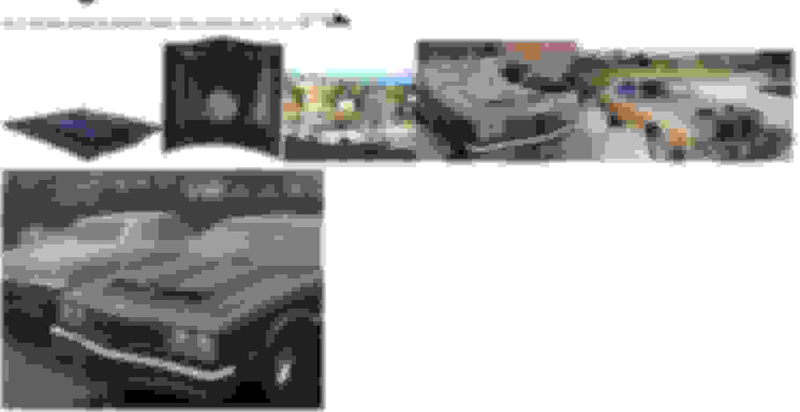 Last edited by youngoldsguy; January 19th, 2019 at 04:24 PM. Welcome. It's nice to see there is still hope when the younger crowd shows interest in the classics. Post some pics when you get the chance. Welcome and keep us posted on your progress. I know it will be a fun and rewarding journey and you will have the coolest car! Welcome to the site. BTW, it's Cutlass not Cutless. Is it the Supreme coupe or sedan? Thank you for the welcome's guys. I will have the oldest car amongst my buddies lol. They aren't into these cars at all. But that's ok they will be shocked lol. They are into the Acura's and the Subaru's. Mostly imports actually. I like them as well, I would like a 2014 or bit newer Acura TSX one day. But I will be the first to have a cool classic.I doubt they will see appreciate as much as I do. It felt really cool to drive it this fall. A few sure take a look. I won't have the coolest car lol, but it will be the coolest amongst my buddies lol. I actually really like the Blue on in your picture Greg. I like the old round headlights better than the rectangle ones better. The hood with the snorkel looks cool as well. Allan, my car is a coupe and yes its a Cutlass lol. I won't misspell it again lol. It has a V8 350 engine but thats about all I know so far. My Dad isn't a car guy really. But he said he would try to work on it with me . So that will be cool . I hope to find some wheels like your silver ones Allan. I like them much better than the hub caps I have . I will post some pictures of it the next time I go to my Grandma's. If her house sells soon. I will be bringing it home quicker. Really happy I signed up here . Welcome to the site. Congrats on the car and thanks for the great story. Its great to get younger people with awesome attitudes. Post some pictures when you get a chance. welcome,those cutlasses were great cars.your father sounds like clint eastwood in "grand torino"
Welcome to the site, Jesse, and congrats on being able to enjoy your grandma's car. It sounds like you have a lot of history and memories with it! You'll find the crew here is very helpful and knowledgeable...and will generally take it easy on you ;-) Keep your eyes open in your local Buy/sell/trade sites and you should be able to find some rims like Allan's. They're a stock Oldsmobile wheel. They're common in the 14" size but tires are getting harder to find now, but if you're lucky you might find some 15" wheels with the right bolt pattern for your car. 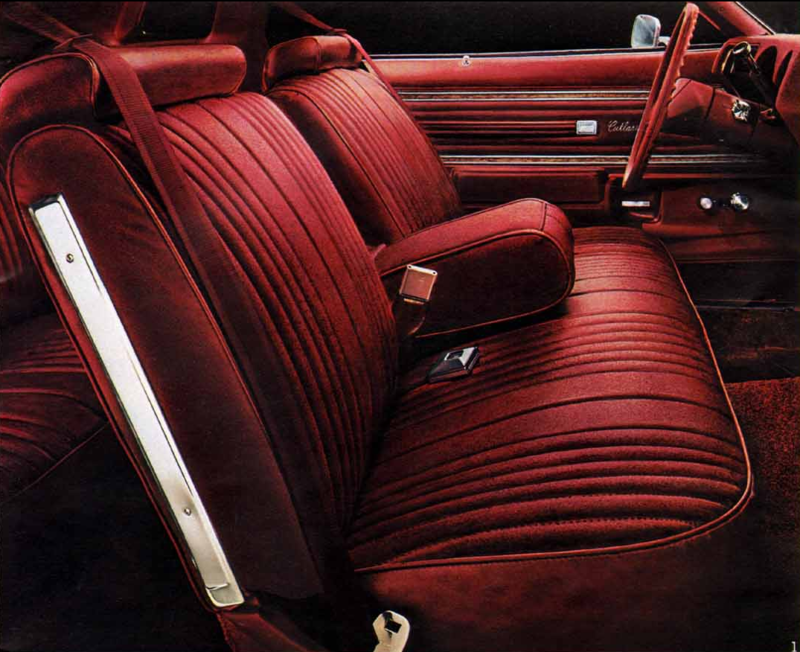 The 1976 is a very nice looking car and has a well appointed interior. What options does the car have? Nice to hear it has the 350 though. The hood with the snorkel looks cool as well. Learning curve time. The hood you're referring to is the W25 OAI hood. OAI is Outside Air Induction. Similar concept to the Pontiac/Buick Ram Air, and Chevy Cowl Induction, just labeled different for Olds. It came standard on some high performance cars but was a factory option (also referred to as RPO - Regular Production Option) or dealer installed option on others. It requires a special air breather assembly under the hood to function properly. Back in the day they were about $158 for everything. Now a 'correct' reproduction sells for $3000.00 + about 600 for the hardware and under hood components. I have 2 sets of those wheels. They are called Super Stock (SS) Depends on color. If they are argent, they are SSII. If they are body color they are SSIII. 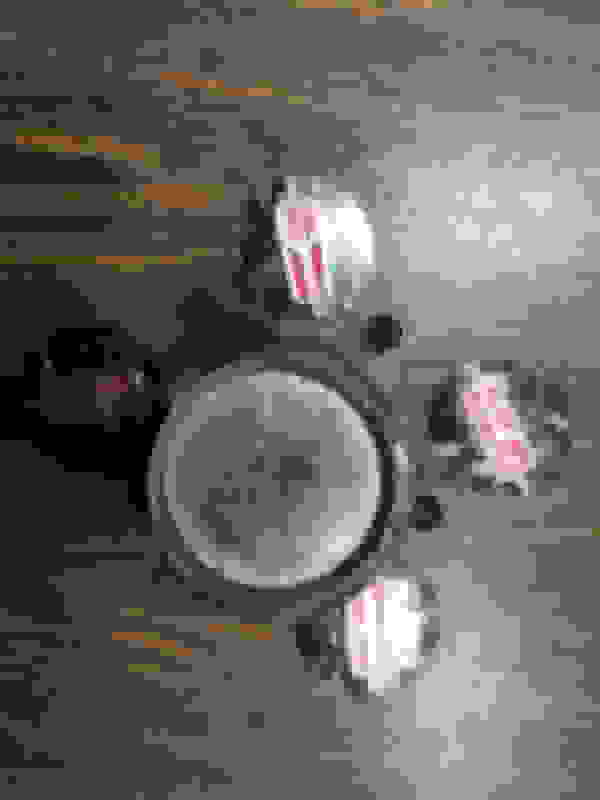 As mentioned they are available in 14 and 15" diameter, although the 15" diameter is getting harder to find. Your Wheel bolt pattern is 5 x 4.75 so it's quite a common GM size. Mine are 14" and I had no trouble getting BFG at Costco for a great price installed. These wheels are also available in bolt on center caps, and snap on. These are the SSII ones I restored 2 years ago. (bolt on center caps go in the middle) They are 14" x 7". Two of them were NOS (New Old Stock), the others were purchased and shipped via on line shopping. This is before the tires were bought and installed, so new valve stems not shown. 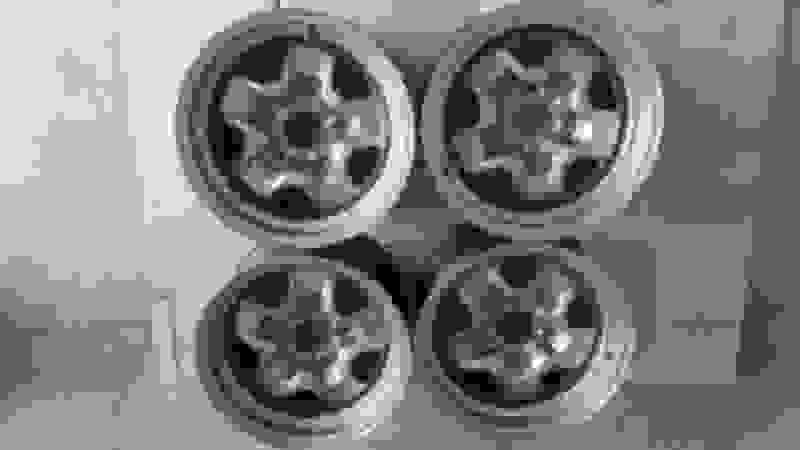 The wheels also require a trim ring, and bezels to go in the kidney shaped openings and the bolt on center caps go in the middle. Plus of course the mandatory chrome wheel lug nuts. You will find a lot of items for sale on this site and there are several sellers who are close to you in ON, just south of the border. Your Grandmother is giving you something to cherish for her, enjoy all the memories that come with it over the years. As others mentioned, its really nice to see a young guy with interest in these Older cars. You will find this site to be very helpful, many here will answer your questions. These guys here are brilliant when its comes to Oldsmobiles. They welcome guys here no matter what year Olds they own. Unlike many other sites on the web. I hope you hang around. My wife and I, own a 1976 as well. They are very reliable and comfortable to drive. I can try to help with some questions as well. We also live in Canada. Are you in or close to a major city ? As Allan mentioned, the stock rims come up at times here, they are a nice rim. They will transform the look of your 76 immediately. However, listen to your Dad haha! In reality, its your car now and tastes vary between all car owners alike. One piece of advice... If you plan on keeping the car, don't worry about how much it could or will be worth one day. Just make it the way you want so you can enjoy it for many years. If you need help with some mechanical or electrical, all these guys will help out, but try do some due diligence at times. Ther is loads of information here to read through. You mentioned you drove the car in the fall, were you happy with the performance and handling overall ? Do you have any plans on making it quicker or handle a bit better? These cars are not like anything new, be it import or domestic. That will take some getting use to when your cruising around with your buddies this summer. Don't put your "Pink slip on the line" until you realise what you have haha. 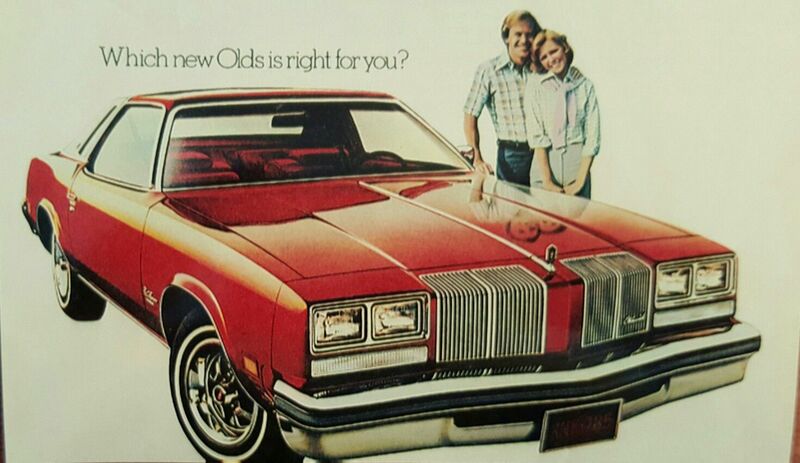 You have a really nice Olds, keep it beautiful !! I'n my opinion, that is better than "Neuspeed" I think the kids call it. I like Chrome as well, However, it can be expensive and time consuming to keep it clean. If that's the look you like, then go for it. Looking forward to some future posts, keep us up to date when you get time. As others mentioned post some pics when you get a chance. First I need to tell you all. I have what you call autism but I am really good with getting better with it. 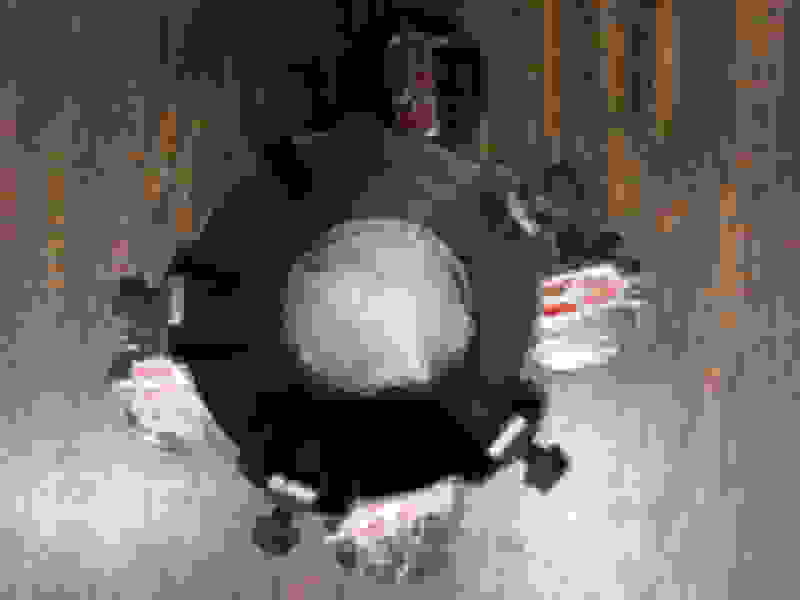 I'm not the best with computers and with how to post here properly. I will learn as quick as I can thou. Please be patient with me if you don't mind. Thank-you for liking my story, I an really lucky actually. Especially to be able to come on here and enjoy your site.
. I asked my Dad but he said we don't have any pictures that we could put up just old photo album pictures. We will take some a put them up soon thou. My Dad told me not to rush him on the pictures until we have time to go lol. Hi Allan. My 1976 is red with red interior. It has full bench seats with the shifter on the steering column. It has air condition as well. It has no power anything like locks or windows or things. It has the radio that came with the car. I'd like to change it someday as well. Wow, about $3600.00 for one of those hoods now. I really like them on those Older Oldsmobiles. Not really on my 76 thou lol. I will begin a search for some of those wheels soon thou. I will look for some of those wheels in the adds and stuff. Are they really expensive you think ? Hi 76olds. Thank you. I may need to ask some questions one day soon lol. I like those stickers lol. I live kinda close to Collingwood but in the country 27 minutes away from town. I drive to work near Collingwood. It takes me 14 minutes. I have only driven the car 3 times last fall actually. Its not as fast as my buddies cars I know that for sure. It drives really nice thou. Turning is smooth breaking is really good but turning like my friends Subaru no for sure. I wont be trying to race them lol. I don't think my 76 will be as fast. For sure getting going. my car won't speed up like any of my buddies. But mine looks better lol. I want to make it sound like most of the big old cars at A &amp; W. That is what I like. Wheels for sure. With white letter tires for sure . Some chrome on the engine for sure. I don't need it to be really fast and squealing tires and stuff. I really just want it to look super nice for now and enjoy polishing it after I put a nice paint job on it. I'm not sure how much my boss will charge me to do the work but my boss said if I pay for all the material and stuff I can do it at night if I like. I hope to start it soon after I get to bring it home. My Dad said we may go get the car in the next couple weeks and I will post some pictures then. Thank you everyone. 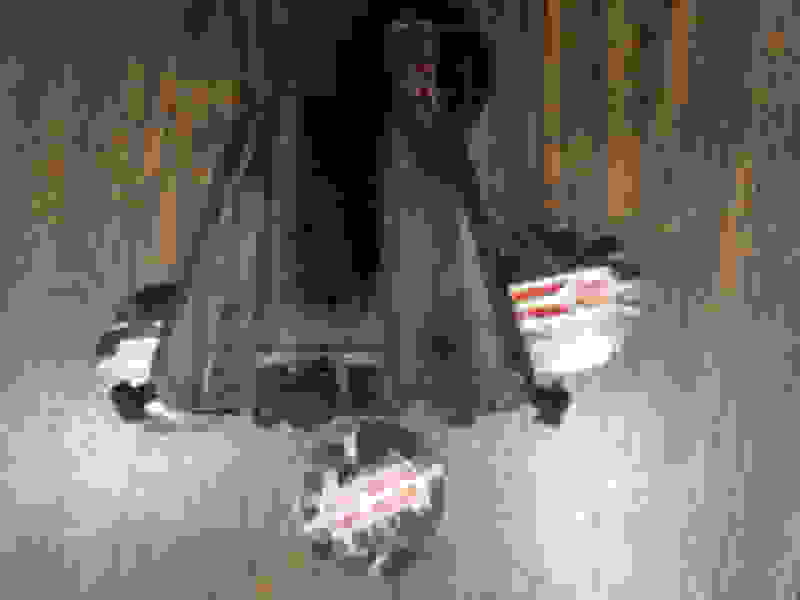 Last edited by youngoldsguy; January 20th, 2019 at 02:13 PM. Reason: Tried to fix to have better sentences. Welcome, like others have said It's nice to see young guys interested in older cars. Have fun working on it and driving it. BTW, there are aftermarket hoods for the 1976-77 Cutlass that have the appearance of the OAI on earlier years. This one is on a friends car in Sherwood Park. Ken Pilidis is the Pres of the Northern Lights Olds chapter here and his car has won national awards. He calls it The Beast. It's one of only 143 built in 1976 and one of 6 442 W30 cars that came to Canada and he has all the documentation and original parts. That hood is made by VFN and Ken said it wasn't too bad to install. I've had the privilege of playing with opening and closing it as well as playing with his car. Hi Allan. My name is Jesse Johnston. Yes. the red one looks the same. I really like that hood on the blue car. Them hoods do look cool. I don't think I will be getting one lol. I want some wheels first. Then I will paint the car and wheels at the same. Im going to look for some soon. Jesse, before you jump on the wheel hunt you need to verify what size wheels and tires are on your car. I believe the 76 came with 14" but not sure if there was an option for 15"
Hi John. Thank-you. 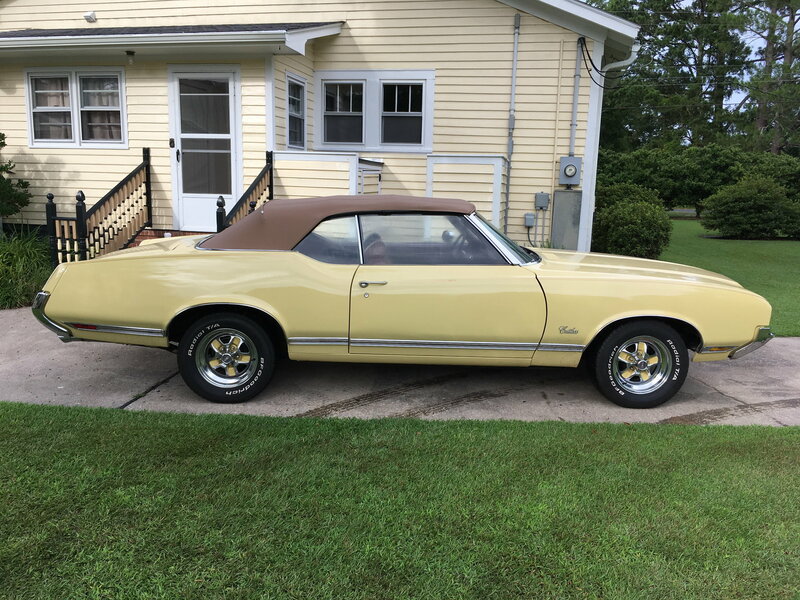 Im really happy to have a 1976 Oldsmobile Cutlass Supreme. I like working on cars. This one was my Grandma's . I hope to make it look almost new one day. Hi Allan. The wheels are 15 inch. I know that for sure. The tires are P215-75r15 with a whitewall ring.The white wall ring is not white anymore.Its really marked up. I will wait until I have enough money to buy 4 of them. I hope I can find some in Collingwood or close by. Its a long drive to the south border. Gas is expensive here. How old are you? I used to be the youngest guy on another board.... that was 14 years ago. Olds guys will treat you well. Welcome aboard! Jesse, the 15" SS wheels are very hard to find and they command a premium price because everyone wants them. Just a heads up. the wheel bezels and center caps remain the same, just the trim ring would need to be larger. If there's no rush, just keep looking for now. There are plenty of Olds guys in the Ontario area. BTW your gas prices right now are less than us, we're at 99.9/L and I see you're around 90.9/L. Shipping from USA to you might be cheaper though. You might try the "Parts Wanted" section of this site to put out feelers. 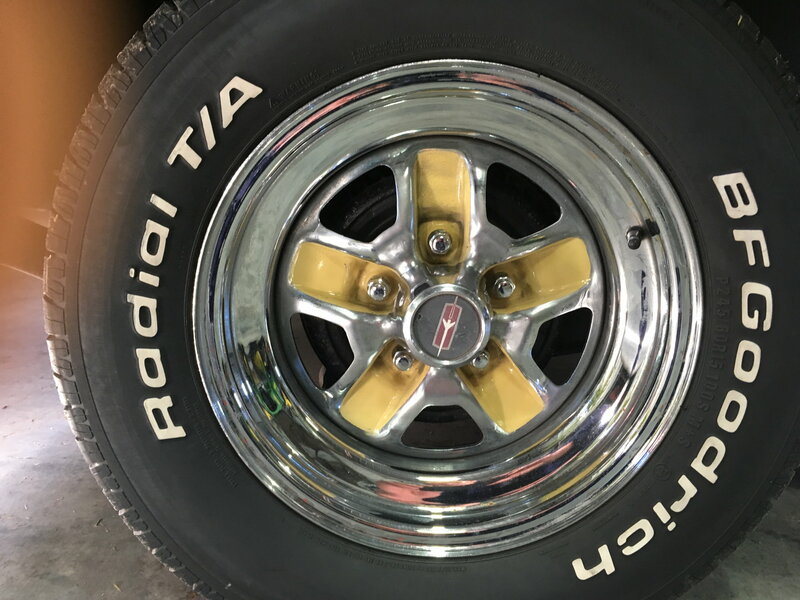 I have 15" SSIII mounted w/ BFG P245/60R15 and I believe they are correct for my 1971 CS (the wheels - not the tires); yet, I haven't spent the time to validate. These wheels (plus spare SSIII wheel) were on the vehicle when I purchased. I suppose if I had a build sheet (which doesn't appear likely I'll find on a USA Lansing built vehicle) I could find this information more readily. Instead, I need to spend the time researching the OEM build specifications for the vehicle. We've determined a lot of information from the cowl tag, VIN derivatives, etc. ; yet, I just haven't spent the time to adequately address what I'll call the build package on this vehicle. I've seen yours and Joe's build packages on various posts, but it's just a labyrinth of information to decipher when my attention is mainly drawn to working on the vehicle itself. Someone, can't recall who (but I can look it up) said my Sienna interior was only available during the 1971 model year). CO is a plethora of information! Your 71 likely came from the factory with 14" wheels given that the PK 5 tire option (G 70/14) was what the 442 came with off the line. 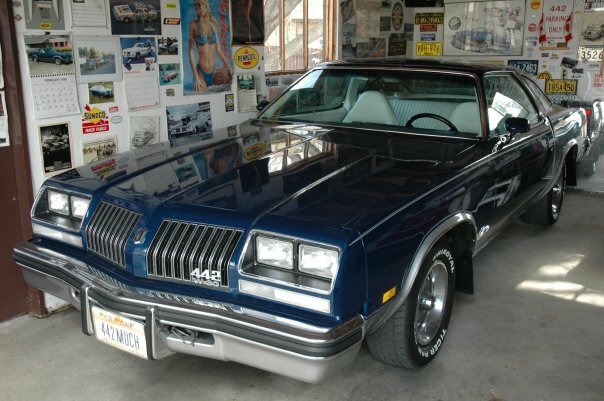 Similar with the rest of the A body including VIsta Cruiser. I suspect the PO likely bought them and installed them. Good option to have. What are you running right now? And yes, Sienna was a one year only 1971. Code 979 for your car I believe.. Uh, I'm running over to my coffee pot. Not sure what you're asking. Could be a brain-fart on my part. 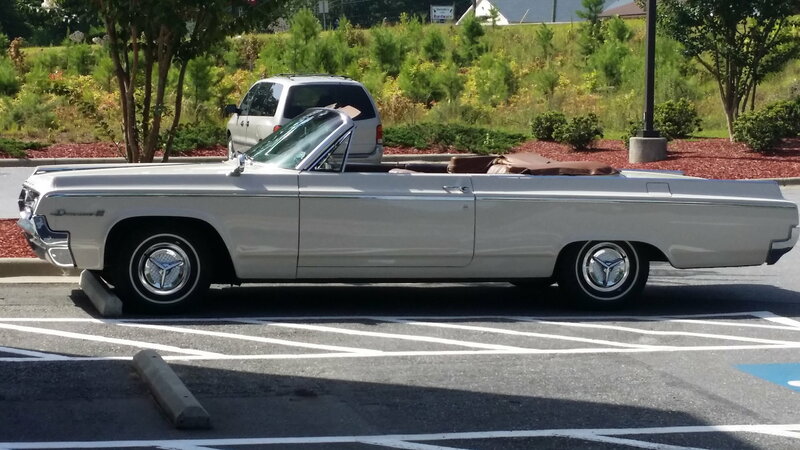 The very first vehicle I ever owned (which my father said I was going to buy and pay for myself because he was tired of me blowing up his 1964 Buick Wildcat convertible white/crimson) was a 1967 gold 442 (pretty sure he wanted it himself). I remember replacing the bias-ply tires more than a couple times. When it comes time to R&R the current BFG P245/60R15 skins, I am going to replace w/ bias-ply (because that's how I want to roll). Yes, I have the bolt-on center cap 15" wheels. It's actually above 32*F at the moment! Maybe time for some exercise. I'll venture out into the man-cave and grab a couple of pictures to post. Yeah, so - I don't mount this bolt-on onto my spare - what's the sense to it? I own a spare in case I need the spare. It's a daily driver and I routinely toss my golf clubs & push cart into the trunk. If I have to change the tire along the roadside, I'd just as soon not have to deal w/ a bolt-on while negotiating a tire change. In total, I have x5 bolt-ons - x4 mounted on the vehicle's wheels. And, there were a fistful of emblems in the glove box when I purchased. I haven't cleaned up this bolt-on, yet. A couple other things to address beforehand. BTW, Jamesbo, supposedly (as I was told) this vehicle was never titled outside of the state of GA. I bought it from a very local used car dealer here in Beaufort, NC who picked it up at auction in Greensboro, NC. Of course, he told me the AC was working, also. About $750 later it was working - after I did an R&R on the core, drier bottle & compressor. LOL I was able to nudge his ribs enough for him to fork over a check for $300 (after the purchase) so as to ensure he remained on speaking terms with me. Last edited by Vintage Chief; January 22nd, 2019 at 11:46 AM. Thank-you. Well I will be 21 in 18 days. Just 20 now. So I may not be the youngest lol. I'm feel very lucky to be able to own a 1976 Oldsmobile Cutlass Supreme. I would never have been able to buy one since they don't make these anymore. My Grandma's took really good care of her car. I will keep her car and take care of it the same way. She will be happy I did. One day I can give it to my kids. Well I'm single now. All the older guys here have been very nice. The welcome has been really nice. Allan has been a big help already. He knew my car before I put a picture up lol. I'm really happy to be a part of the Oldsmobile group. I am Jesse .Thank you everyone. Hi Allan. I think I should look for some different wheels lol. Maybe I can't afford them lol. Do you think 14" wheels will fit if they are not that expensive. I would like to know if thats ok. If not. I will be happy with different ones. I seen some cars here have nice wheels. Im writing down what they are. Then I will search for them if 14' wont work. I really like those wheels Vintage Chief. They will look cool on your car Im sure. They are the wheels currently mounted on my car. Jesse- I don't believe you have posted a picture of your car, yet. Can you post a picture of your car showing the current wheels on your car? You'll get lots of suggestions which might help you make a decision. Hi Norm. Its Jesse. I can't post any pictures yet. My car is still in my grandma's garage. I have to wait until my Dad has the time to go up and pick it up. We are making room in the garage now so I can bring it home. I have been asking my Dad every day lol. I can't ask him anymore he starts to get mad at me lol. My mom told me to be patient. So Im being patient now lol. Hi Allan, That picture is almost the exact same. Those hub caps are what I have yes. My car has the white roof but red interior. The tires are the same . I can't wait to go and get it now lol. I talked to my Dad. Im going to wait until the car comes home. Then he will let me buy some wheels. He said I can buy some engine parts if I want. We need to make room first before I can buy anything now. I look at so many cars here. I know what I would like now. I just have to wait. I will post a picture of my car as soon as I can. I like being here and you guys are the best. Thank you . Like your dad says be patient. We can wait and look forward to pictures when you get them. Hi Jesse! Welcome to CO. 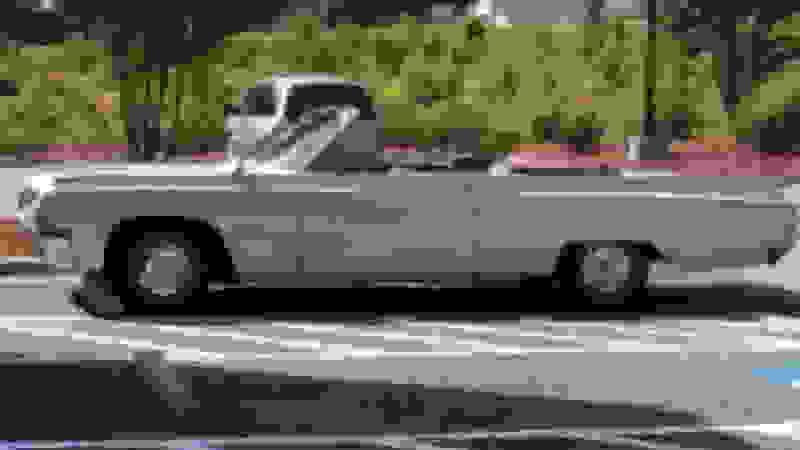 The fact that you have access to and wish to drive, an iconic Oldsmobile will make you the envy of all your friends and a few more you'll find at the car shows and cruise in you attend. There is a wealth of knowledge on this site so go easy with your renovations and take things slow and steady. 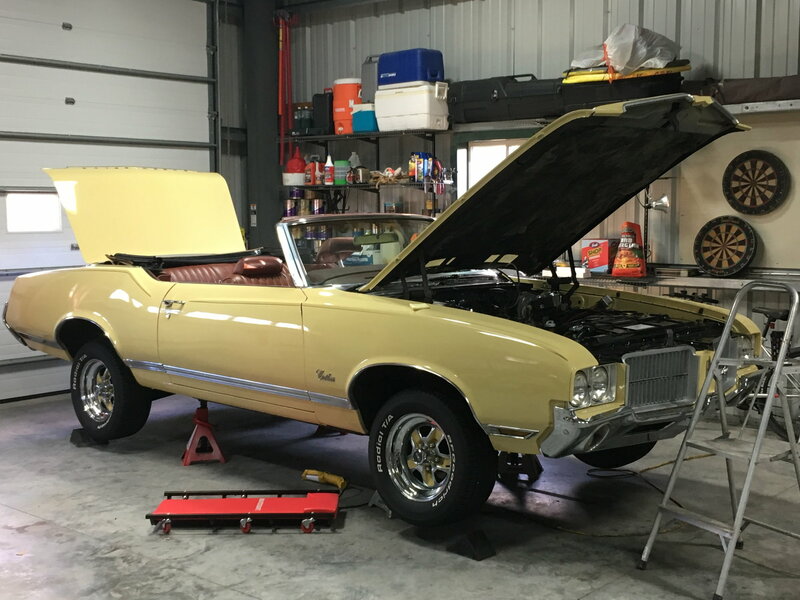 You and you dad ought to have a blast and years of memories of working on this Olds together. Enjoy the ride you have. Trust me, there won't be many like it in your neck of the woods!